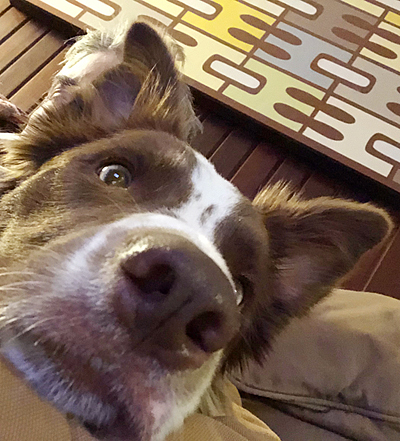 If I had a dime for every time I told (border collie) Finn to relax, well, I’d probably be able to retire again – right now. This weather is hard on fly fishers and fly dogs, or dogs who want to fly. But, I am speaking for myself – here in North Texas, which in reality is no better, no worse, than a blurred Southern Oklahoma. We’ve been lulled by the last couple of winters, winters that weren’t anything like what we remembered. And about the time we put our old, worn Carhartt quilted suits away? Here comes the old man, grey and soaking wet. He put the damper on the “Leslie’s Annual Backyard Show,” an art show in our back yard, a damper on First Friday Denton, and the damper’s on fly fishing within a hundred miles in any direction. If it’s not wet, then the bets are good that the water, wherever it runs, will be mud from runoff. But since the temperatures this Friday morning are the warmest they’re going to be for the next three days? I’ll tell my wife, “I’ve gotta go see a man — about a fish,” and slink out the side door fully loaded with rain gear and layers, lots of dry layers. Some days, just some of them, can be salvaged by just “seeing the man,” even if it’s not about a fish. When I get back, the house will be in a fevered pitch. The house is being transformed INSIDE, for the backyard show – so that the brave souls who do want to have original art for Christmas can invade our home, see five maybe ten vendors, and walk out our front door happy. So I will scrape all the debris off my fly tying table, and try to tie some flies that matter right now. For those of you who wonder what flies matter? I have caught plenty of slabby rainbow trout on woolly buggers in those Guadalupe green holes, and they are a fine fly for most of the stocker scenes in Texas or Oklahoma. See – GUAD River Fly Fishing Information – for more stories on Guadalupe trout. When it comes to tying flies, it is very easy to fall into a pattern of tying only patterns you know and you know work for your variables. But what that does is perfect your small motor skills for only a few tying moves. Heck, I need a bunch of my killer whistlers for a good day of chasing chain pickerel – see MORE STORIES ON CHAIN PICKEREL – in East Texas. And we’ll always be keeping an eye on the next prize – whatever that may be. Thanks for reading this frosty Friday, and be brave! The challenge of weather is the reason we ALL bought our warm fly fishing layers. Put a layer, or two, on and check out the Backyard Show right here Saturday, or get out tonight and enjoy First Friday Denton, in Denton, Texas. When was the last time you experienced Denton?